What You Will Have to Pay for RV Detailing? Purchasing a motorhome is a considerable investment, and you’ll want to make sure that you put time and effort into keeping it clean. Cleaning and protecting your motorhome and increase its longevity significantly. One of the best ways to protect your new investment is thorough detailing. Unfortunately, many owners believe that detailing is too expensive and is not worth the cost. If you do not protect these materials, they’ll breakdown. Not only will they look bad, but they’ll become more brittle and could, therefore, decrease the lifespan of your vehicle. The cost of detailing pales in comparison the price of a new vehicle. The cost of detailing depends significantly depending on the cleaning services selected. For instance, a full vehicle detail is more expensive than a mere interior detail. Most detailers elect to charge by the foot. 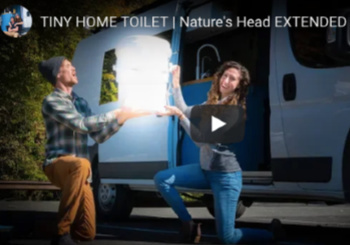 Depending on the type of motorhome that you own, the detailer you choose, and the services that you wish to have performed, the cost can range from $9 per square foot to $35 per square foot. 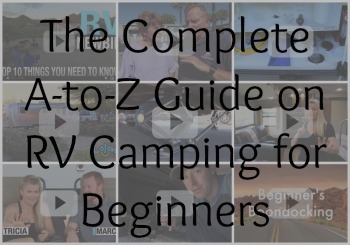 Below, you’ll find a more detailed breakdown of how must you will have to pay for RV detailing. We’ve included questions commonly asked by our readers. Although the costs can vary from RV to RV, we hope that the information provided below will allow you to compile a more accurate estimate of your detailing costs. RV owners should expect to pay between $10 – $ 12 per foot for a basic interior detailing. Many detailers determine this cost by measuring the vehicle’s linear footage. Additional services like spot-treatment or protecting leather interiors could drive up costs significantly. Detailers can offer services that include detailing cabinets, deep-cleaning appliances, shampooing carpets, and applying stain blockers. A full-service interior cleaning could cost upwards of $22 – $25 per square foot. We recommend that RV owners pay for a full-service detailing when they are done using the camper for the year. Inadequate cleaning methods could lead to a host of problems when you open the RV again in a few months. For instance, ants may find leftover food sources in your vehicle and colonize as your motorhome lay dormant for the winter. A full-service deep clean is not necessarily required after each use, especially if you’re using the camper frequently. However, you should at least consider a basic interior package that includes dusting and vacuuming. 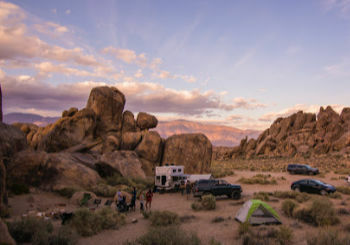 Remember that the dirtier you allow your RV to become, the more expensive the cost when you decide to clean the vehicle. One of the best ways to save money on RV detailing is by doing it yourself. When you pay to detail your RV, most of your costs are a result of labor, not the products themselves. The soaps and other products that you’ll use to detail your RV are relatively affordable. Taking the time to learn how to detail your RV could save thousands of dollars during the life of your motorhome. Even if you don’t detail the entire RV yourself, doing a portion of it at home could cut your costs considerably. For instance, consider deep-cleaning the interior of your RV on your own time. You could even rent a carpet shampooer for a couple of hours to deep-clean your carpets. This way, you’ll only need to pay to detail the exterior of the vehicle. If you are purchasing products to detail your motorhome, try buying products in bulk. Many manufacturers discounts when ordering multiple products. Because you plan to have your RV for a while, the up-front cost of the cleaning supplies should pay for themselves quickly. You should also look for detailing deals in your area. Many detailers will offer discounts during non-peak seasons because their business has slowed considerably. If your detailing can wait a few months, see if you can’t find a bargain package that could help ease the financial burden. 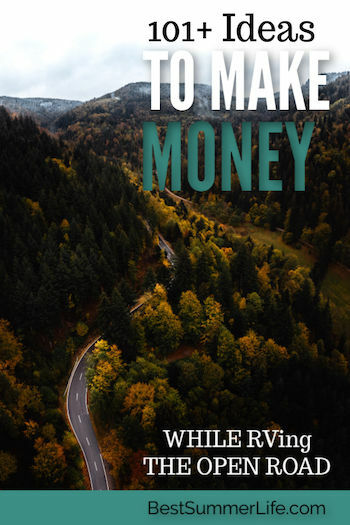 One of the best ways to save money on RV detailing is by keeping it clean enough that you can cut back on the frequency in which you need these services. Detailing the exterior of the RV can be an extensive process that requires many steps. One of the areas you’ll need to focus on is the roof, as it is exposed to the hot sun frequently. If you do not apply a rubber roof cleaner to the top of your motorhome, you’ll increase your risk of water damage. Although often neglected, the roof is one of the most accessible areas of your motorhome to clean. Here’s a more detailed section on what the differences are in roof cleaners and what to look out for when you are picking one out. 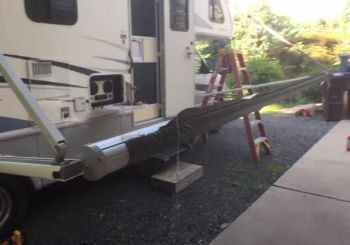 How Do You Take Care of a Fiberglass RV? If you need to take care of a fiberglass RV, you’ll need to follow a few steps carefully. 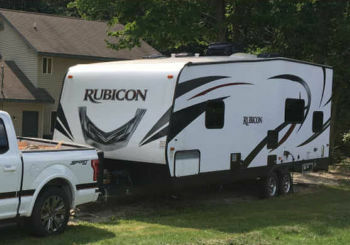 Most people who are going to detail their own RV will need to follow these steps, considering that manufacturers typically make modern RVs with either fiber-reinforced plastic or fiberglass. Caring for your fiberglass provides it with a smooth, glistening finish that is sure to drop jaws. First and foremost, you’ll need to make sure that you clean the motorhome frequently. Use a car wash to protect your RV against dirt and grime. However, make sure that the carwash solution does not contain alkaline, ammonia, or acid. These materials can darken the gel coat and alter your RVs appearance significantly. You’ll also need to wax the motorhome frequently. Your RV manufacturer likely coated your fiberglass in a gel coat. The gel coat will deteriorate when exposed to the elements. Once this occurs, you’ll reveal your fiberglass frame to the elements which will further increase the deterioration process. A wax coat protects the gel layer from the elements. If you notice that oxidation has set in on areas of your gel coat, you’ll need to first remove it before waxing the motorhome. You can do this by using a polishing compound. We recommend using polishing compounds that contain abrasives, as this can help scrape away the oxidation that has occurred. You’ll then want to buff the polish with an electric device or elbow grease. If oxidation on your fiberglass is extreme, you’ll also need to consider a wet sanding. We recommend that you allow a detailing expert to perform this service on your vehicle. During a damp sanding, detailers will soak sandpaper for 24 hours before using it on your RV. The sandpaper ranges from 600 to 2,000-grit. An extensive polishing always needs to follow a wet sanding. While the shell of your motorhome is likely fiberglass, you’ll also find plenty of aluminum and other metal parts. Aluminum likely makes up most of the exterior metal on your RV. Unfortunately, aluminum is very prone to oxidation. If your aluminum is unpolished, we recommend using a polish made of aluminum oxide. These products will remove water sports, tarnishes, and oxidation. Start by wetting a sponge and rubbing it back and forth over the polish until you’ve established a thick lather. Then, begin scrubbing the aluminum in circular motions. Keep working away at the metals until it is reflective. Use water to rinse the polish, and then buff the metal using a microfiber cloth or old rag. If you have chrome anywhere on your motorhome, your cleaning techniques will be a bit different. Chrome is a plated metal, which makes it resistant to tarnish and prone to rusting. If you notice that oxidation has occurred on the chrome, you’ll need to use something like a calcium and lime remover to get rid of it before it attacks the remainder of the metal. Keep her clean and keep her on the road longer!